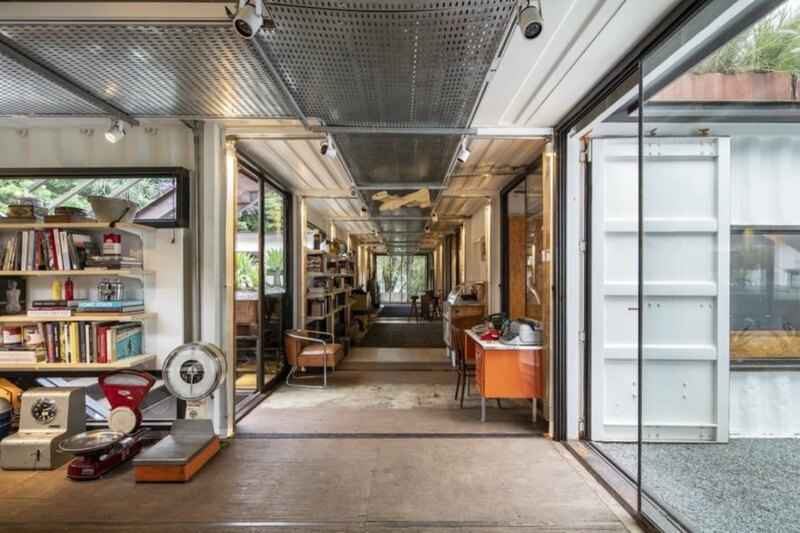 São Paulo-based architecture studio SuperLimão and architect Gabriela Coelho recently completed GSC, a massive multi-use collector’s gallery built from shipping containers and other metal materials. 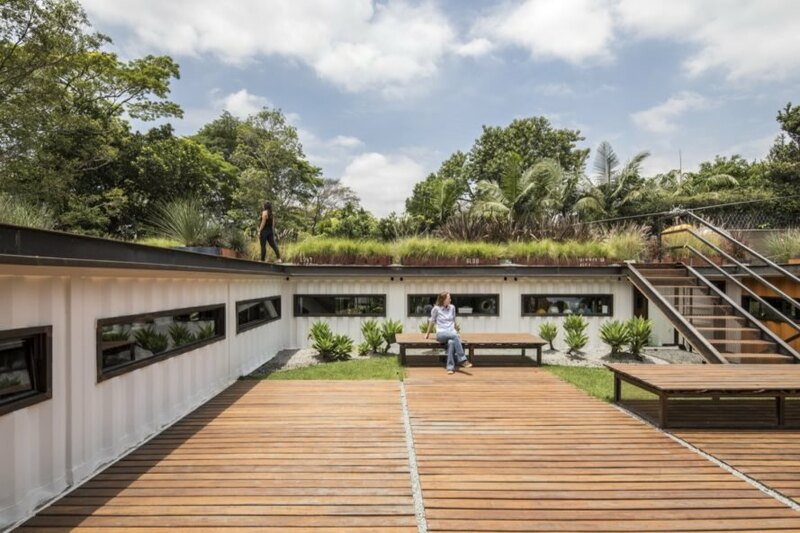 Located in a lush area of São Paulo, the spacious complex also contains an office, a gym, a small workshop, a kennel and additional gallery space for the client’s other prized items. The industrial character of the cargotecture project was softened with the addition of turf and potted plants, while passive solar techniques were employed to maximize energy efficiency. 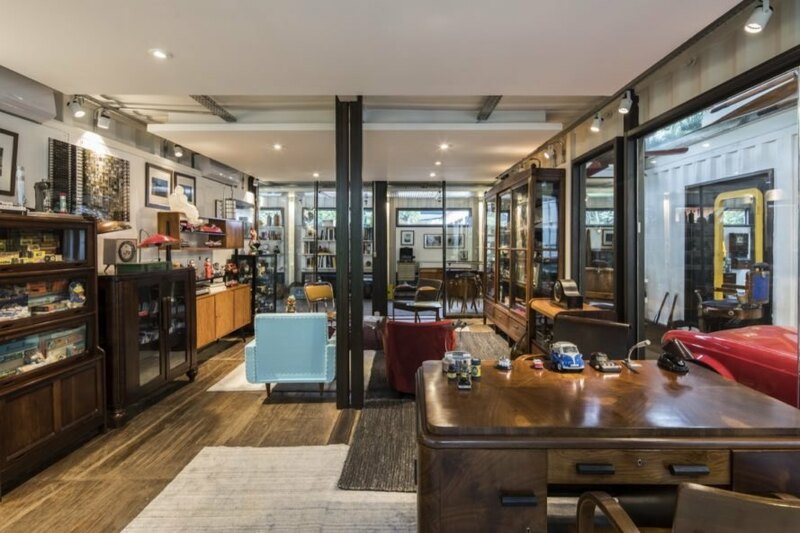 Covering an area of nearly 19,400 square feet, the GSC is a multilevel project that houses the garage on the ground floor and uses a series of reused shipping containers stacked on top to form the upper level. Rather than place all the containers side by side in a row, the architects strategically arranged the 10 containers to promote natural ventilation, lighting and sight lines between the different areas. The interstitial spaces between containers were converted into green space with seating and timber decking. The roofs of the containers were also landscaped with rows and rows of potted plants. “One characteristic that differentiates our project from the usual container projects that we are used to seeing is that this particular project is totally adapted to our climate while utilizing the maximum passive techniques of form to maximize energy efficiency and take advantage of reusable materials from the container itself,” the architects explained. “All of the spaces have windows on three different levels. They not only allow for ventilation, but they also perform at an optimal level on days without wind. The exterior walls are finished in a ceramic paint and work in conjunction with the roof covered in foliage to thermally regulate the internal environment thus reducing the use of air-conditioning equipment.” Air conditioning is only used during the hottest parts of summer. 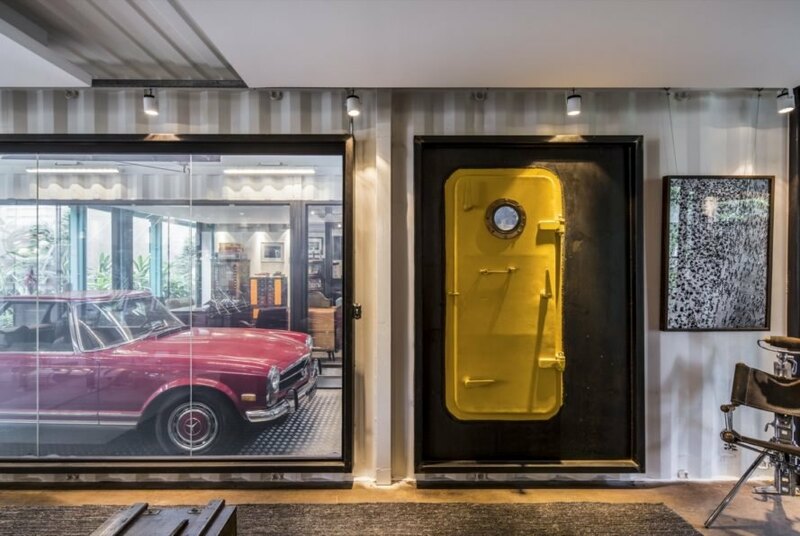 The interiors of the containers were renovated to house a variety of rooms, yet the look of the original walls and doors was preserved to reference the building material’s history. Full-height glazing creates a sense of permeability that continues throughout the structure. Outside, rainwater is collected in a large cistern and reused. 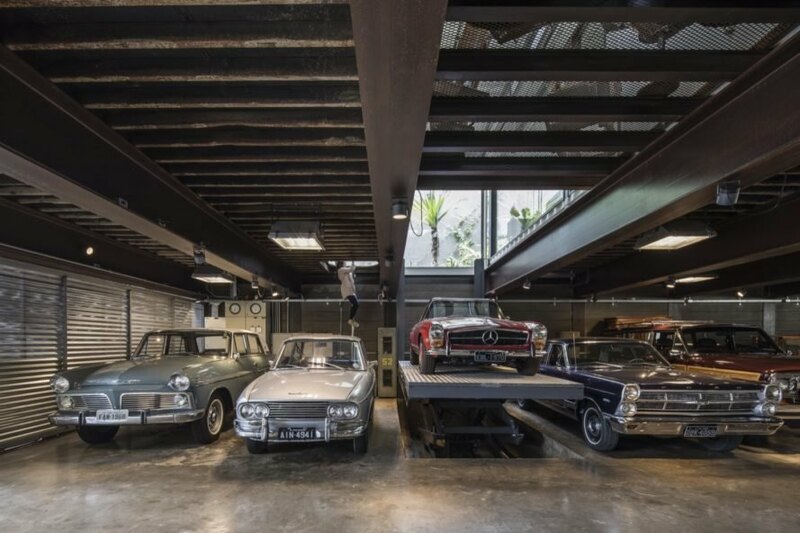 This structure, called GSC, is designed as a gallery space for an art and car collector. The space is built from 10 shipping containers. Inside, vintage vehicles are on display. 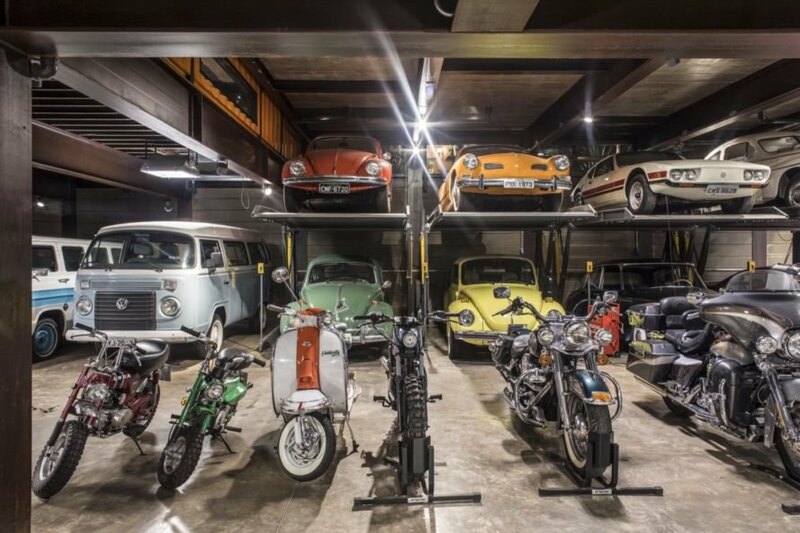 These old cars and motorcycles are just part of the client's collection. 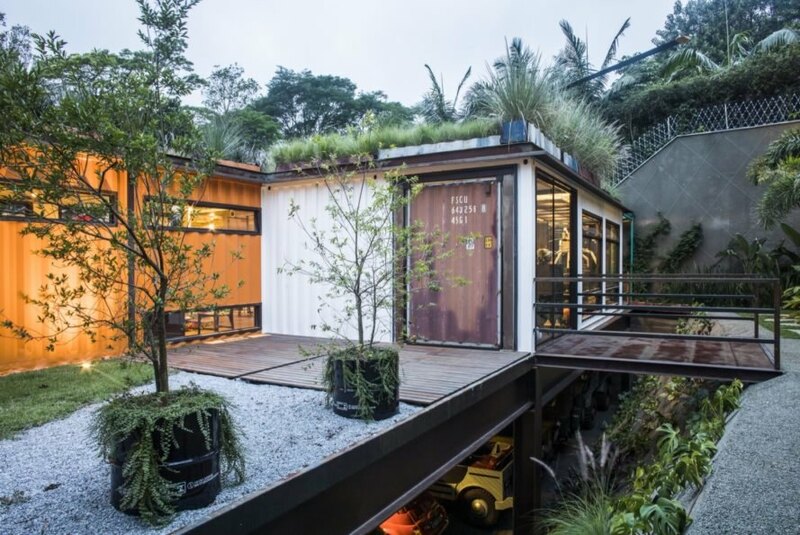 The roofs of the shipping containers are landscaped for additional space to relax. The cars are on full display. The structures also house several art pieces. The architects used passive design principles for energy efficiency. The shipping containers are arranged to maximize natural light and ventilation. Outside, every space is covered in greenery. The containers house a variety of rooms. The original walls and doors were retained.